King Salman of Saudi Arabia - (Google Photo). A Saudi prince has been arrested after a video emerged online purporting to show him abusing someone and pointing a rifle at another. A popular adage says "When you see a prince, you must see his royal apparel"
But one prince is about to lose his royalty if he is found guilty of abusing someone. King Salman ordered the arrest and interrogation of the prince on Wednesday, a day after short video clips were published on YouTube and shared on Twitter showing what appears to be a rifle pointed toward a man who is bleeding from the head and pleading. One clip, viewed more than 760,000 times, also shows 18 bottles of Johnnie Walker Red Label whisky displayed on a table and a wad of cash. The sale and consumption of alcohol in Saudi Arabia is forbidden. Another video clip shows a man sitting in a car, bleeding and being cursed at for parking in front of a house. Another clip shows what appears to be the prince punching and slapping a man who is sitting on a chair. The clips went viral in Saudi Arabia under an Arabic Twitter hashtag that said "prince transgresses on citizens." 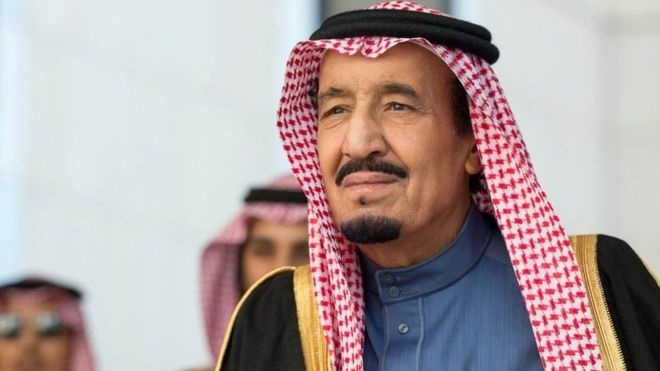 Saudi Arabia's state TV reported Wednesday that the king ordered a full investigation into the incidents and the arrest of Prince Saudi bin Abdulaziz bin Musaed bin Saud bin Abdulaziz, as well as any associates that appeared in the clips. He ordered that no individual involved in the case be released until a court has issued a ruling in line with the country's Islamic Shariah laws.